I always liked to have a fruity touch in my veggie salads. Unfortunately, no-one else in my family shares this passion. On the other hand, good: more of these salads for me. 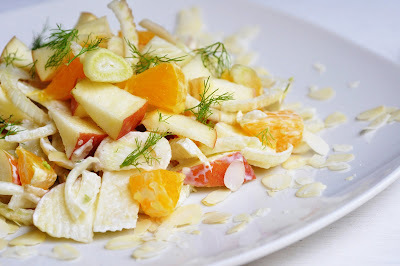 This fennel salad is more a fruit than a veggie salad as its sweetish licorice flavor fits more into the fruity corner than the tart section which is reserved to a big number of veggies. Now here we go: raw, crunchy and refreshing fennel, oranges and apples are combined and dressed with an amazing sour cream dressing. I prefer this salad cold rather than room temperature. But that's probably a matter of taste, and has also to do with the scorching heat that we still have to endure here in Dubai. It can be made in advance and keeps well. Make it in the morning and take it to work for lunch or afternoon snack: simple, no-fuss, healthy, yummy. Trim fennel bulbs off the root and remove outer skin if too thick or browned. Thinly slice fennel bulbs and stems. Keep the fronds aside for later. Cut apple into quarters. Core, then dice apple pieces. Peel orange and dice. Combine fennel slices, apples and oranges in salad bowl. Combine all ingredients for the dressing. Pour over salad and toss. Garnish with fennel fronds and sliced almonds.